Comedian Tim Krompier has been entertaining audiences in New York City and all across the country with his original autobiographical style of comedy for several years now. Tim has the sly grin and rage of a 30-something rabid frat boy on an insult spree. Pay attention and underneath his devastatingly good looks (his mom told him to write that) and hilarious mockery of marriage, family, and the world around him, lives a little boy who just wants to cuddle. Born and raised in New York and a co-founder of Haft2Laugh, Eric Haft has appeared in such classic venues as The Borgata Hotel & Casino, Caroline’s on Broadway, Standup New York, Broadway Comedy Club, Governor’s Comedy Club. Eric is a regular act on The Long Island Comedy Festival as well as many other venues around the country. His unique blend of comedy and theater, as well as his take on everyday life, has made him one of the East Coast’s most sought after personalities in the industry. Don’t miss this original entertainer and his cast of zany characters! Eric has performed with many of today’s top comics such as Ted Alexandro, Kevin Meaney, Carie Karavas, Peter Bales, Rich Walker, Keith Anthony and countless others. He’s been a professional entertainer since the ripe old age of 12 and is an accomplished musician as well as stand up comedian. MC Mike Nicolia will lead the event. As always we include dinner and the show. Choiced include salad and a: Skirt steak, Wild Salmon, Chicken Parm, Penne Vodka, Cobb Salad or Steakhouse Burger. Doors open at 6:30 for dinner, show starts at 8pm. Limited seating so reserve early. No refunds, thank you. Our third event! We've had two amazing shows with great laughs, food and drink. This month's show features Christopher Brian Roach (Motts) from the CBS Show Kevin Can Wait. Peaches Rodriguez with also be entertaining and the show will be hosted by Stephen Rocco Parillo III. Menu choices include: Skirt Steak, Wild Salmon, Chicken Parm, Penne Vodka, Cobb Salad and a Steakhouse Burger. Salad and Chips/Dips included as well. Doors open at 6:30 for dinner, show starts at 8pm. Limited seating so reserve early! In addition to our regular menu on Christmas Day, New Year’s Eve and New Year’s Day, here is our special 3 course holiday menu. A Happy and Healthy to all and we hope to see you soon! Out with the old, in with the new! 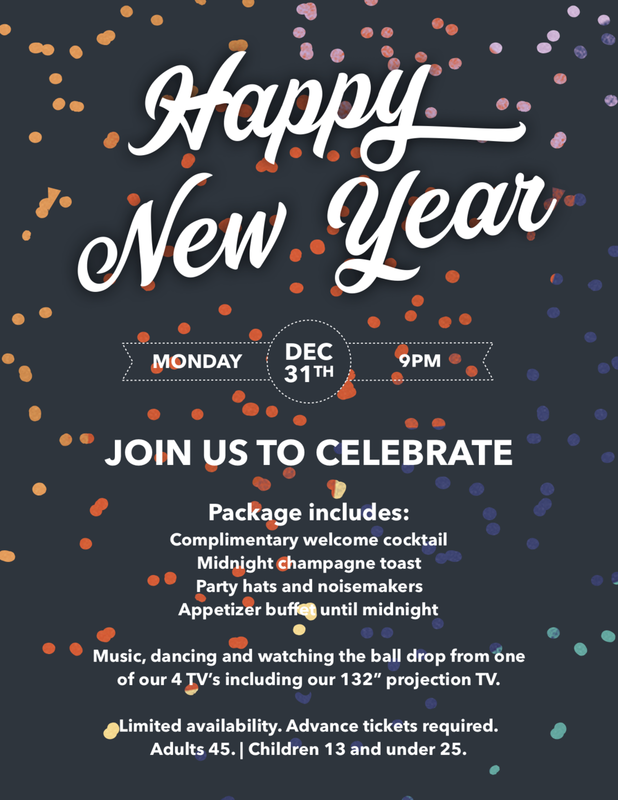 Spend New Year's Eve at Pantry and watch the ball drop from one of our 4 TV's including our 132" projection TV. There will be music and dancing from 9pm until 1am. All tickets include a complimentary welcome cocktail, midnight champagne toast, party hats, noisemakers and an appetizer buffet until midnight. Cash bar all night long. We will be open and offering both our regular and special Thanksgiving menu throughout the day until our last seating at 6pm. Reservations are highly recommended and a wonderful holiday to all. That leads to a big gig at the Tropicana Casino in Atlantic City opening for the Isley Brothers. Then he did a television show called the Comedy Factor and a month tour in Amsterdam and Rotterdam. Teddy has done the Aspen Comedy Festival. Tours all up and down the east coast. Headline the Paramount Theater in Huntington Long Island, Theater Three in Port Jefferson, The Smithtown Performing Art Theater. He appeared in a movie titled Umbrella’s Kill, appeared on Live At Gotham, Comedy Central, Comic View, Showtime, Jay Leno’s Tonight Show Website. Teddy covers topics Divorce, Family, Kids and social issues. Every morning, join us at our communal table, aka the “Breakfast Club”. Starts at 7am daily! It has been a wonderful few months since our re-opening seeing old friends, making new ones and listening to your feedback as we’ve tried many new things. Before we opened we spent a lot of time thinking about changes we wanted to try and much of it was well received. We have realized though that some things weren’t and as we celebrate our grand opening we are changing a few of them. First and foremost while we opened as a non tipping necessary establishment we have abandoned that model and will now operate as a traditional restaurant. We have heard from many of the discomfort with the policy and never intended it to be such an issue. We only wanted to provide a more stable and steady income for our staff and felt it was something that would be well received by all. Unfortunately that was not the case so we have reevaluated the policy and have reversed course. As we make this change we have reduced prices throughout our menu and are offering more value in many other ways. We will be continuing to tweak and try new things in the coming months and are excited for the times ahead. We thank everyone for their support and feedback and look forward to serving the local community for years to come. Our new menu is in! Headlined by new appetizers, salads, sandwiches and an expanded dinner menu. Available to view as always from our website. Introducing our new All Day Happy Hour! Something special every minute of every day... See menu for details. Delivery is now live through Uber Eats and Grubhub. Order from their apps or websites to have the best food delivered right to your door. Effective Monday July 2nd we will be open from 7am until Midnight daily. Stop by for a drink or to try some of our delicious homemade dessert.